Arthur Conan Doyle is at a crossroads. His creation, Sherlock Holmes, has taken over his life and his other desires to create different characters and different genres is rejected as the public and his publisher only want Holmes. So he does the unthinkable. He kills Holmes thinking it will get him the freedom he seeks. Doyle is unprepared for the public reaction. Life at home is not much better and his ailing wife burdens him further. Suddenly a request for a meeting arrives and Doyle is thrust into the world of seers and mediums. Doyle finds himself thrust into the mystery of a murder yet to be committed. With his good friend Oscar Wilde in tow, Doyle travels to Thraxton Hall to protect young Lady Hope Thraxton. It is here where the séance will take place as a group of paranormals gather to contact the dead. Doyle struggles to piece together a mystery of family darkness and tragedy. Until he unravels a curse over Thraxton Hall and all the remaining descendants. A mystery worthy of his own creation, Holmes himself. 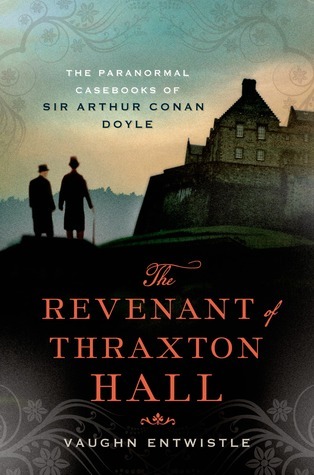 The Revenant of Thraxton Hall is a worthy addition to the Doyle mythos. But it is the Doyle mythos and not the Holmes mythos that it is a part of. Conan Doyle’s interest in the paranormal is well documented and his involvement in several actual mysteries of his time as well. Oscar Wilde does more than offer color commentary as well and is a strong addition to tale. This is a well written novel and the banter between the two drive the story as well as the detailed moments of paranormal activity. This novel moves at a good clip and the writing is very good. I look forward to the next mystery to come.